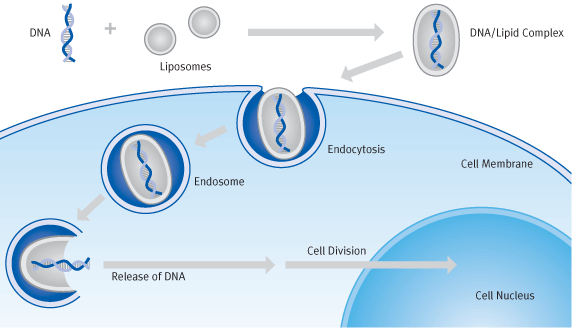 In cell biology, transfection is the term given to the introduction of foreign genetic material /DNA or RNA) into eukaryotic cells. In addition, a distinction is made between temporary introduction into the host cell (transient transfection) and permanent integration into the genome (stable transfection). 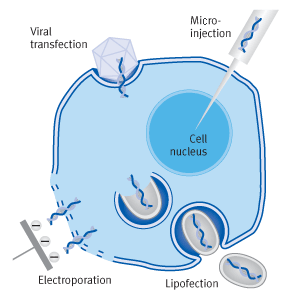 The process of transfection basically corresponds to that of bacterial transformation, albeit under a different name. Chemical methods include calcium phosphate precipitation, transfection using cationic polymers and - among the most efficient methods – lipofection, using cationic lipids. The Transfection reagents of Biontex (DOTAP, METAFECTENE®, METAFECTENE® PRO, METAFECTENE® SI, K2® Transfection System, K4® Transfection System) belong to the last group. 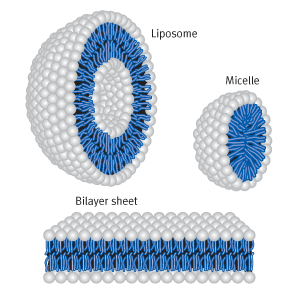 Lipofection is a complex process in which the lipoplex amount and proportion of genetic material in relation to transfection reagent, i.e.lipoplex composition must be precisely optimized for each cell type. Transfection reagents and methods show different profiles of performance in dependance of kind of nucleic acid and cell type used. Without reference, it is not possible to predict the suitability of a reagent or method concerning a special application and has to be determined empirically. Our "Transfection Reagent Selection Guide" supports you in the selection of a suitable transfection reagent for your application. We also offer samples for free, so you can test whether one of our transfection reagents is suitable for your purposes, without having to bear any costs. RNA Interference (RNAi) is a natural regulatory mechanism in gene expression, controlled by short-chain RNA with approx. 21 – 28 nucleotides which are complementary to the mRNA of a target protein and can be found in all eukaryotic cells. 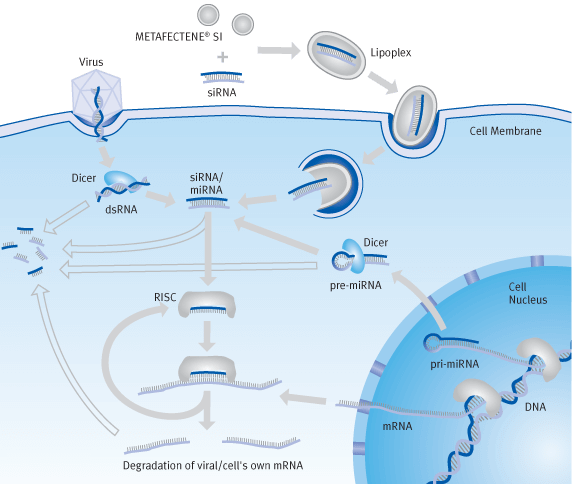 A distinction is made here between siRNA and miRNA, which is formed in the case of siRNA from doublestrand RNA (e.g. endogenic from transposons or exogenic from viruses) and, in the case of miRNA, from hairpin-structure endogenic RNA (from own pri-miRNA genes) by means of enzymatic cleavage with an endoribonuclease (Dicer). These small RNA strands are bound in the cytosol by a ribonucleoprotein complex – the RISC complex (RNA induced silencing complex), the RNA double strand is separated and the leading strand is presented. When a complementary mRNA strand binds to the leading strand, it is broken down or deactivated by the RISC complex, thus preventing expression of the target protein and down-regulating the corresponding gene (knockdown). The discovery of this mechanism, known as "gene silencing", has been a major research milestone in recent years, and is a powerful tool in the field of proteomics and research into functional relationships between genes.